Going on a hunting trip to Ontario is on the bucket list of many hunters and for good reason. The sheer space available to hunt up here (95% is Government land) along with the variety of species you can hunt are probably two things that motivate a lot of hunters but there are other reasons in addition to these two. I would put forth that a hunting trip to our wilderness regions is something different than what you can find in most other places - especially most other places in the United States. The raw wilderness you traverse on your hunt makes it quite a bit different than the corn fields back home, or hunting animals that are penned up behind a fence with no chance to escape. A trip here is completely different and one where you'll need all the skills you've developed over the years, from planning the hunt itself to actually tracking the animal(s) you're after. Up here, you're in their environment so you have to be ready and aware. Speaking with many American hunters, many have mentioned to me that it's the challenge of a hunt in Ontario that really gets them excited. Traversing our rugged Canadian Shield landscapes and figuring out what that whitetail deer or moose may be doing and when presents a unique challenge not faced by hunters going after big game on private reserves or government-owned land stateside. Another bonus is the lack of other hunters - there are no crowds in the woods in these parts - and if you do see another hunter, it's a rare occurence. Other more intangible but much more exciting factors also come into play - the ornery mood of the bull moose you hope to get should put every hunter on notice. Bulls in the rut are easily the most dangerous animals in the forest up here - more dangerous than bears or timber wolves - so planning what you do, how you do it and when you do it must all be considered. Those who take the time to figure things out - and do it the right way - are the ones that often go home with that bull. So what can you hunt on a trip to Ontario's Sunset Country? Lots of species is the short answer but to be more specific, the list below gives you some idea of your options. 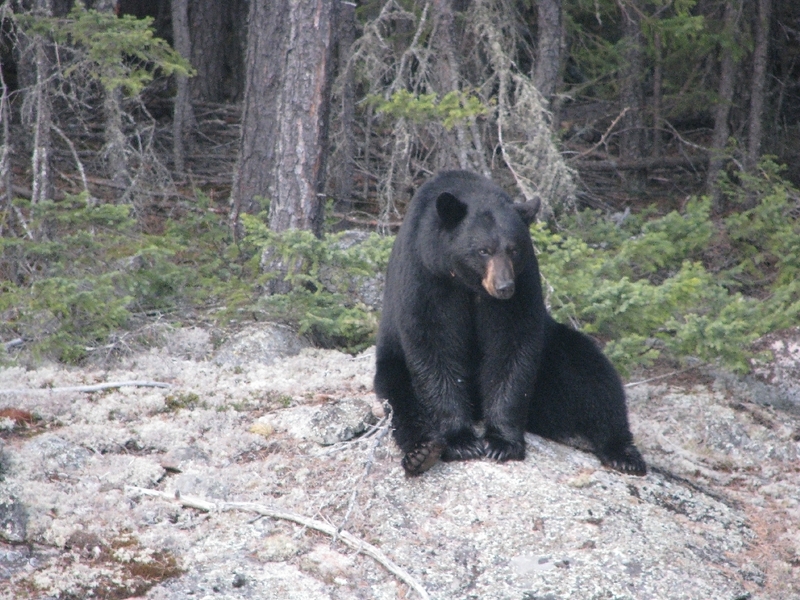 Black Bear: With an estimated population of close to 100,000 anaimals, Ontario can stake the claim we are one of the best locations in Canada to hunt black bear. Colour phases ranges from the common black to black with white patches/marketings, brown, cinnamon and the rarest of all, a blond colour phase. Average-sized females range between 200 to 300 pounds with the big girls near the 400 pound mark. Boars are a different story when it comes to size - averaging between 350 to 400 pounds - with the big boys tipping the scale at 500 pounds or more! Here's a link to all the bear hunting outfitters in Ontario's Sunset Country. Moose: While the population of moose in Ontario is currently at a low point, some WMUs still have very healthy populations. 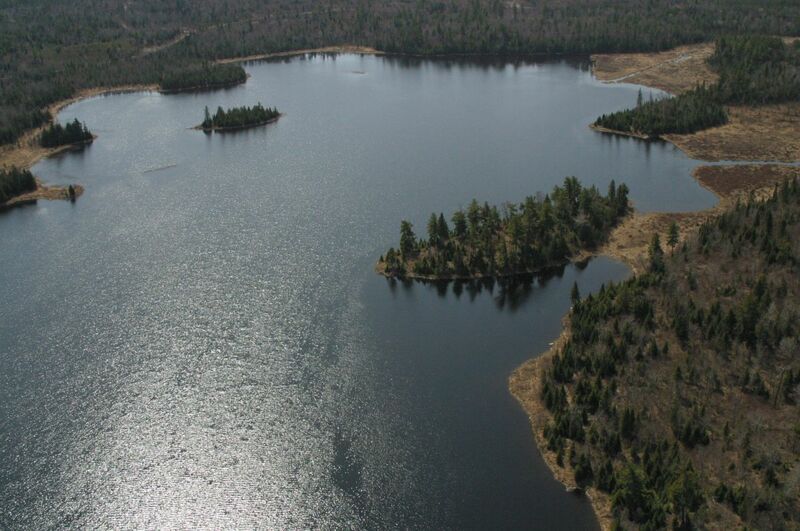 American residents are required to stay with a licensed outfitter who has a tag allocation provided to them by the Ontario Ministry of Natural Resources. You are buying the tag and the accommodation/guide package when you come up to hunt. Bull, cow and calf tags are available - contact the specific lodges offering moose hunts to see what they can offer you. Whitetail Deer: Prolific breeders, whitetail deer are all over the place in Ontario's Sunset Country - including large resident populations living right inside our towns and cities. While these urban deer are off limits, there are plenty of "wild" deer outside the municipal boundaries. With the colder climate, our whitetail deer are much larger in size than most deer you see in the USA with the biggest bucks tipping the scales at 300+ pounds. Hunting for whitetail deer in Sunset Country is definitley one of our main draws to hunters from across the USA. Here's a link to a listing of deer hunting outfitters in Sunset Country. Grouse: One of our best kept secrets is the incredible ruffed grouse hunting we offer. There are thousands of the tasty birds living in our Boreal forest and they are relatively easy to find and hunt. Grouse seem to prefer locations adjacent to abandoned logging roads or trails where they can access the gravel. These birds taste as good as or better than chicken and you'll definitely go home satisfied if you visit us to hunt them. Take advantage of the great fall fishing at the same time. Here's a link to outfitters offering Ontario grouse hunting. When visiting Ontario, it's very important to know and follow all Provincial and Federal laws regarding firearms. In Ontario, eligible firearms include rifles, shotguns, muzzle-loading guns, air or pellet guns, bows and crossbows. You may use semi-automatic or repeating firearms for hunting in Ontario, but not handguns that are restricted or prohibited firearms or fully automatic firearms. Air and pellet pistols with a muzzle velocity less than 152 metres (500 feet) per second may be used for hunting in Ontario. You are allowed to bring in 200 rounds of ammunition duty-free. Any above that amount is subject to duty. Ammunition must be encased and stored separately from your firearm. For additional information on importing firearms into Canada for hunting purposes, see the Canadian Firearms Centre website. Because of the vast size of Ontario and the different Wildlife Management Units (WMUs) here, the regulations differ depending on where you hunt and what you are hunting for. It is strongly advised you familiarize yourself with the general regulations as well as the specific regulations that may apply to the WMU you'll be hunting in. Hunter orange is required at all times when hunting in Ontario. To obtain a hunting license as a non-resident of Canada, bring a copy of a current or expired hunting license from your State with you, or a certificate showing you successfully completed an approved hunter's safety course. 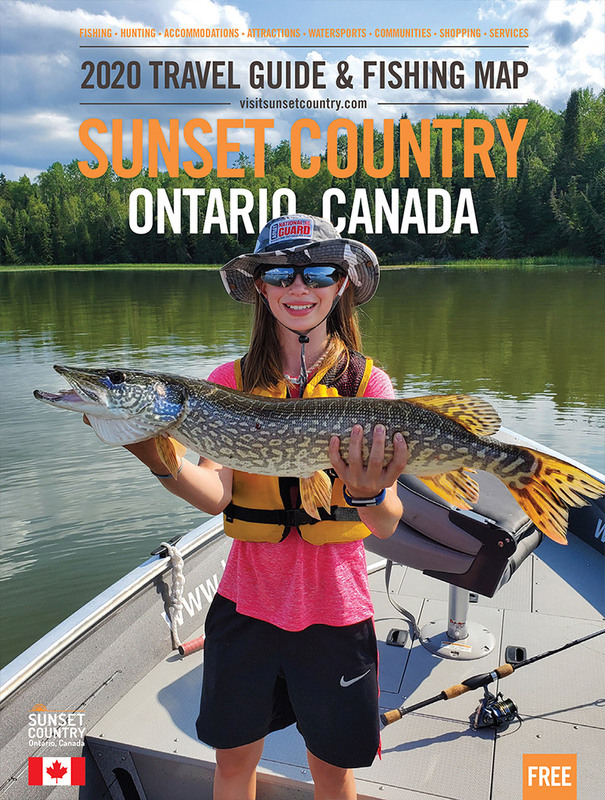 If you're a hunter looking for something completely different, it is definitely worth the trip to Ontario's Sunset Country. We hope this overview of the species we have to offer as well as some of the other information related to bringing your firearms across the border will be helpful to you when you're planning a trip. Links in the article will lead you to our list of outfitters offering hutning packages. Contact them directly to book your trip. You can also contact us here at the Travel Association. We can likely answer most of your questions about hunting in our region. Email us at info@visitsunsetcountry.com or call us toll-free 1-800-665-7567. Use this link to order your Free Travel Guide and Map.